FPGAs, or field-programmable gate arrays are traditionally used to perform a specific algorithm in hardware. The result is a bulky and expensive chip (produced in low quantities) that runs a certain algorithms at very high speed and low latency. Offloading some processing tasks to a specialized chip is certainly nothing new. APUs are CPUs that offload some of their tasks to integrated GPUs. But quite a few parallel algorithms run fast but pretty inefficiently on GPUs. In many cases, an FPGA uses a lot less power. Intel has been delivering "customized" Xeons to large customers such as Amazon en Facebook, and has been promising that it will integrate Altera FPGAs inside certain Xeons. Intel recently bought Altera for $16.7 Billion. But IBM seems to have beaten Intel to the FPGA punch with CAPI, the POWER8's Coherent Accelerator Processor Interface. IBM does not integrate FPGA inside the POWER8 package (yet), but communicates coherently over the PCI express interface. The most interesting fact about "Supervessel" that is IBM has managed to make a cloud service that makes ample us of - traditionally expensive - FPGAs, and that the necessary software is in place to make it relatively easy to make use of those FPGAs. What software did IBM implement to make offload some of the processing work to the Xilinx FPGAs? Unfortunately, so far we only saw the press release and it is very light on technical details. 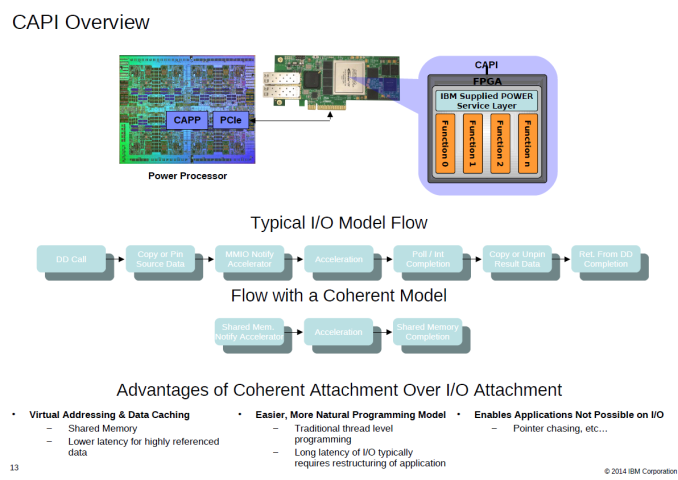 Nevertheless, it is interesting to note that the OpenPOWER Foundation is making a lot of progress in very little time - it was founded only at the end of 2013.